American Bar Association (ABA); Section of Environment, Energy, and Resources; “Handling a Brownfield Headache: What do I do with a property which has no value?” Webinar held June 14, 2017. Eric Williams – Panelist. This entry was posted in News on September 5, 2018 by Legacy Land Stewardship. 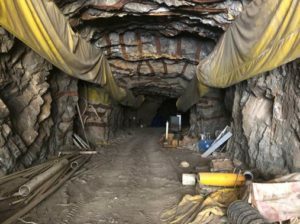 Colorado Legacy Land, a jointly owned company between Legacy Land Stewardship PBC and Alexco Environmental Group, acquired Cotter Corporation’s Canon City, Colorado Uranium Mill and Schwartzwalder Uranium Mine outside of Golden, Colorado. Colorado Legacy Land was formed specifically for this acquisition, and to assume Cotter’s obligations for closure and environmental cleanup of the properties. This complex deal allowed Legacy Land Stewardship PBC to continue its mission of providing a secure divestment solution to owners of surplus, environmentally-impacted real estate that responsibly and permanently delivers sustainable, long-term environmental stewardship. The majority of the 2700 acres at mill and the 580 acres at the mine will be put back into productive use. Consistent with Legacy Land Stewardship’s goals, eco-friendly uses such as solar energy production and open space will be pursued, as well as residential and commercial uses. The transaction provided Colorado Legacy Land with the funding necessary to assume the ongoing regulatory obligations. Colorado Legacy Land also replaced multiple Financial Assurance and surety instruments necessary to backstop the closure obligations with the regulatory agencies. 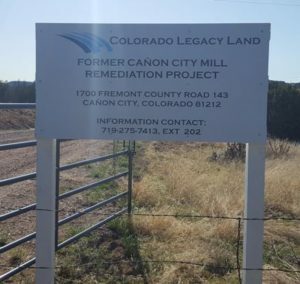 Upon closing the transaction, Colorado Legacy Land immediately took ownership of and began complying with the host of permits, licenses, and regulatory agreements transferred to Colorado Legacy Land (see side bar). Technical challenges to be addressed include ongoing treatment of uranium in mine water at Schwartzwalder, closure of uranium tailings impoundments at the mill site, as well as remediation of uranium and other constituents in soil and groundwater. The Canon City Mill is a Superfund site listed on the National Priorities List, which increases the complexity of cleanup. Download a PDF of this info sheet to save or print. This entry was posted in News on June 4, 2018 by Legacy Land Stewardship. DENVER, CO (July 14, 2016) – Legacy Land Stewardship PBC is a new company specifically created to provide a secure divestment solution to owners of surplus, environmentally-impacted real estate that responsibly and permanently delivers sustainable, long-term environmental stewardship, and seeks eco-friendly reuses for public benefit. As a Public Benefit Corporation, Legacy Land Stewardship can now effectively balance important environmental and social responsibilities with those necessary long-term custodial obligations. Legacy Land Stewardship PBC caters to owners of surplus properties where cleanup is substantially complete, but long-term environmental obligations remain. “From mining sites and landfills to closed industrial facilities, Legacy Land Stewardship PBC is ideal for the owners of these environmental properties” says Founder and Executive Vice President Paul Newman. “Corporate owners of surplus real estate want to concentrate on their core business instead of the perpetual management of non-performing assets”. Contact Founders Eric Williams (Eric@Legacy.Land; 303.521.5805) or Paul Newman (Paul@Legacy.Land; 303.808.8492) for more information. This entry was posted in News on May 30, 2018 by Legacy Land Stewardship. © 2017 Legacy Land Stewardship. All rights reserved. Website design by Jefferson Powers.